I recently suggested that post-processual archaeology was a faith-based approach that mystifies the evidence, but on reflection, thinking of it as a religion, is probably to exaggerate its objectivity. This time, I’m looking at the messages we're getting about, and apparently from, the past, and asking if this new archaeology a New Age cult? 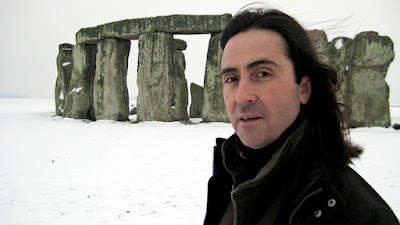 I shall do this with the help Neil Oliver’s BBC program, History of Ancient Britain, which has, through no fault of its own, been singled out to be my Auntie Sally. 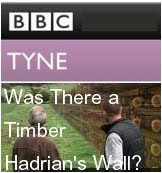 His program is more than just a warm glass of intellectual Drambuie on a Sunday night, but actually reflects some state of the art archaeological thinking, as one might expect of the BBC. For the sake of balance I will try to explain why some archaeologists have painted themselves into the corner of their yoga mats, and readers should be warned be there maybe some intellectual cartoon violence, and outbreaks of Kermodian ranting. People have probably been picking up messages from the Stones since they were first erected, but now some archaeologists have also started tuning into archaeology like postholes, pits, and their content in search of the beliefs and rituals that lie behind them. One aspect is called structured deposition, and it's not just looking for rational behaviour, but belief, in the way things are discarded. The majority for our evidence for domestic prehistoric ‘activity’ comes in the form of postholes, pits, and linear features like ditches. However, if you ignore the postholes, or mystified them as ritual, this means that you can’t talk about ‘occupation’, because you have no buildings, and this leaves the rubbish open to similar mystification. If people don’t live on the site, they must be in some way nomadic, stopping off to do rituals there, and therefore the fills of the postholes and the rubbish pits may be created as part of this ritual life. Thus, ritual posts beget structured deposition, and PhDs could be earned searching through the fills of postholes, pits and ditches for evidence of the rituals, and the belief systems underlying the deposition of the materials that turn up on archaeological digs. 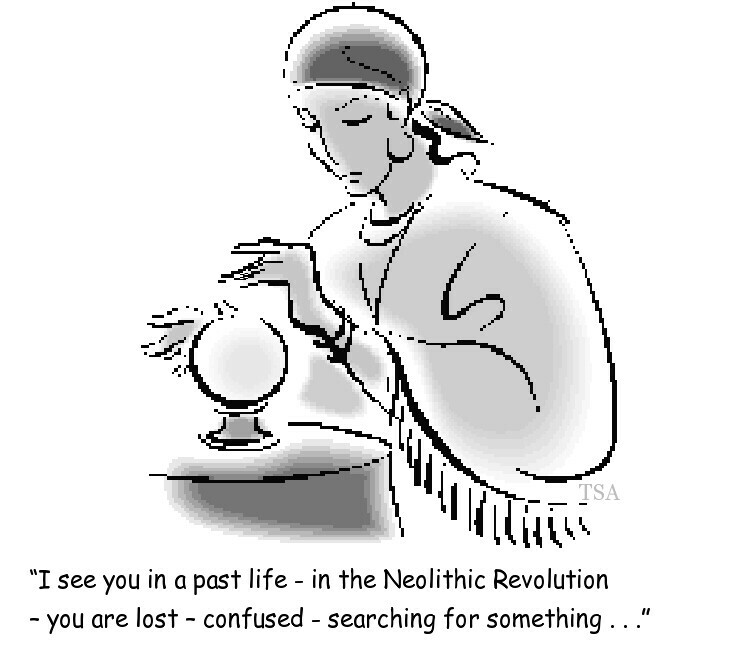 In the Neolithic you can’t just dig a hole, take a dump, throw in your trash, and back-fill it, to use someone else’s vernacular; this was a New Age, they were in the throws of a revolution, and redefining their relationship with the earth, [man]. Once you allow retrofitted belief, perceptions, and cosmologies as a tool of interpretation, it is but a short journey to picking up vibes from the past [man]. It is not Para-psychic archaeology that tells us that our ancestors perceived stone as death, and wood as life, but mainstream academics. Is it something they put in the beer? I have to write this down, throes of the Neolithic Revolution, Alive with spiritual meaning , cool. I choke on my metaphorical pretzel; “If! If!” I scream at the television. Hang on there Bonnie Lad; whose understanding is rooted in stone?
. . . then this landscape that seems to shout the very word ‘stone’, must seem especially important, and here in the central fells the message is particularly clear. Message? What message? Who’s been getting messages? From whom, the National Park, surely not the Neolithic landscape? Journeys, writes of passage, the sky, and some stuff about a spiritual journey, transcend my archaeological brain without touching the sides, as I struggle to re-grasp the tread of the narrative, and transcribe into a notebook. The Cumbrian axe factory reveals a relationship between the people and their landscape and stone itself. This belief system would change over time, it would develop into something much more complex, and for us, enigmatic. Something that represents a whole new age in our history, an age that experts refer to as the Age of Astronomy. I am now hiding behind my metaphorical sofa; Whose belief system? And surely it’s Astrology! It probably involved looking at the entrails of animals, get a grip!
. 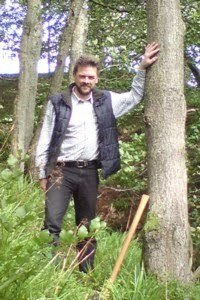 . . .What becomes clear, is that for the people living 5000 years ago, this was a new age bringing a new way of thinking about ancestors, rather it was a new way of thinking about themselves as individuals within an increasingly complex society. …What we see is a radical change in thinking, that manifests itself in something staggering, the construction of monuments of stone on an unprecedented scale. Where did we fit into time and into the cosmos? “ An archer from Amesbury was officially too ill to comment, but his sentiments have been widely reported as . . . .”. To be fair, it is perhaps not meant to be read, deconstructed, or thought about; more inwardly digested with some suitably Celtic spiritual music, images of misty landscapes, and preferably an Indian head massage. I not against tree hugging, or reading peoples auras; I am open to getting in touch with most things, but I draw the line at other peoples’ ancestors; eves dropping the internal dialogue of Neolithic people is borderline spiritualism, not archaeology. Neil does not actually enter a trance, and start communing with our ancestors, but what his intellectual picnic in the British countryside overlooks, is that belief and thinking are precisely the things that archaeologists don’t find. For me, telling us how Neolithic people thought about stone is akin to telling us their favourite colour. Most people can understand that you can’t know much about what people believed or thought thousands of years ago, especially when they have left no records, and thus, creating and retrofitting cosmologies to explain archaeology is a bit weird. 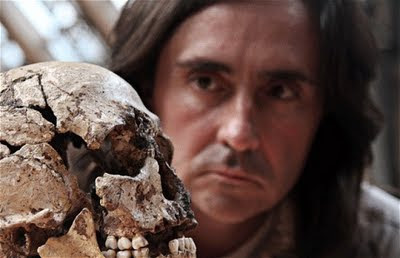 So I think Neil Oliver and I have made the point that some post-processual archaeology is a New Age cult; it’s not even a real religion, it just borrows belief from all over the place. How did British academic archaeology come by this conceit, and embarked on their journey of discovery into the thinking of our ancestors? Anthropology has a lot to answer for, in that, in its attempts to establish connections between, and all embracing theories about, cultures, it ignores differences and emphasises similarities. It somehow creates the belief that there must be some unified field theory of anthropology We‘re all human, so this works up to a point, and it becomes easy to imagine culture as a series of tick boxes, even as evolutionary stages. Thus, because people in East Africa have round houses, cattle, and iron spears, for example, they have ticked the same boxes as people in Iron Age Britain, and it is possible to make cross-cultural comparisons, using the Africans to fill in the detail about the Celts. This is why it seemed reasonable that the original Butser roundhouse reconstruction should have a 45° roof pitch, because that’s what they do in Africa; it leaked, because that is not what we do in England. A lot of the irrelevant cross-cultural comparisons that have bedevil archaeology arise from a failure to understand that building is not simply a psychological impulse, or an extension of mental space; it is a technology. Building is part an individual cultural tradition, which is also response to local environment, particularly in terms of climate and raw materials. Northern Europeans building in oak didn’t need advice from Madagascar, N America or Papua New Guinea; it was kind of them to offer, but it’s a long way to come by canoe. Academic archaeology retreated into the library, locked the door, and tried to excavate the Neolithic mindset, only discover their ancestors behaved as if they had read the same books as them. By using other people’s cultures to explain the origin of our own, we divorce it from its geography and history, and our non-literate predecessors become someone else's ancestors living in a strange and alien world. Why would British huts leak water? Dying of hypothermia because you're soaked to the bone isn't as much a risk in tropical Africa, so the energy invested in making a better roof would be worthwhile in Britain, where it wouldn't be a priority in Africa. I'm pretty sure African huts would have far more energy invested in keeping cool than rain resistance, so it's not like there would have to be any extra investment or technical expertise on either side, just different areas and materials. Not sure why they don't see this. Hi Akheloios, thanks for the comment you make some good points; I think the real big difference is termites. Reconstructers have fixed their problem of the roofs, I think thatchers explained how to do it properly. But they are still realized as a very simple form, like enlarged African huts. I just discovered your blog today - I love the humourous way you articulate issues that have been needling under my skin for a while. I look forward to future posts. So pleased it hits the spot; I hope I can help alleviate the irritation. Times change. Perhaps the hard-shelled materialist 19th c is giving way to other attitudes, and so people reinterptret the past in a different way. Probably archaeology as part of the entertainment media has to keep up with this. After all, that's what keeps the public interested, and consequently keeps the money flowing. Before there were archaeologists there were antiquarians. Afterwords there may be new-age shamans. They all cover the past and it's relics, only in somewhat different ways, depending on the intellectual attitudes of the time. Don't despair. Supposedly Jesus was the son of a carpenter; so you may have a worthy spiritual successor! I believe this is a blog, not a professional journal. I enjoyed your writing, Geoff! Thanks for the spelling correction; dyslexia is an embarrassing condition. Jesus was described as a Tekton [τεκτων], or the son of one, this term is broader than carpenter, and closer to 'builder'. Thanks, I am glad you enjoy my attempts at writing; I am afraid it falls below the standard that might be expected, despite considerable efforts to find the more obvious mistakes. Taken a while to spot this. I think another problem with using modern marginal cultures as analogies for ancient European cultures is missing why these modern cultures are like they are now. As cultures on the edge of or beyond mainstream society they don't or can't necessarily play the game like many ancient cultures in Europe did. Neolithic Britain had a healthy trade in flint and high quality axes, followed by a trade in tin and bronze in the Early Bronze Age. It was not out of the loop. Some people were almost undoubtedly propitiating spirits, others were getting on with making a living in a European trade/exchange network. Thanks for the comment, and I have to agree, especially because of the importance of marine trade, being on an island is not being isolated, it is being connected to the main transport network. Oh, thank God. I was beginning to think everyone else was convinced by this stuff and I was the only skeptic. My absolute least favorite is the loosely applied "hunting magic". It drives me up the wall. 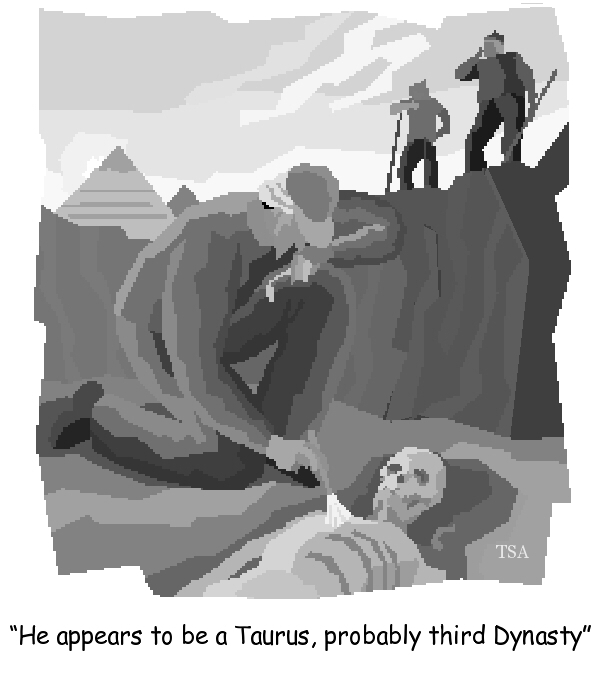 If you think this is bad though, read an art history textbook. That is some interpretive liberty out the yin-yan. Hi Cass,thanks for your contribution; luckily my interests don't extend much into the Paleolithic/Mesolithic, but if it is the subject of the same intellectual smoke & mirrors as later prehistory God help them. I have often wondered how art history deals with early material. I have always been amazed by how apparently intelligent people, who by the standards of the tests we are subjected to, [exams] are my intellectual superiors are so gullible. 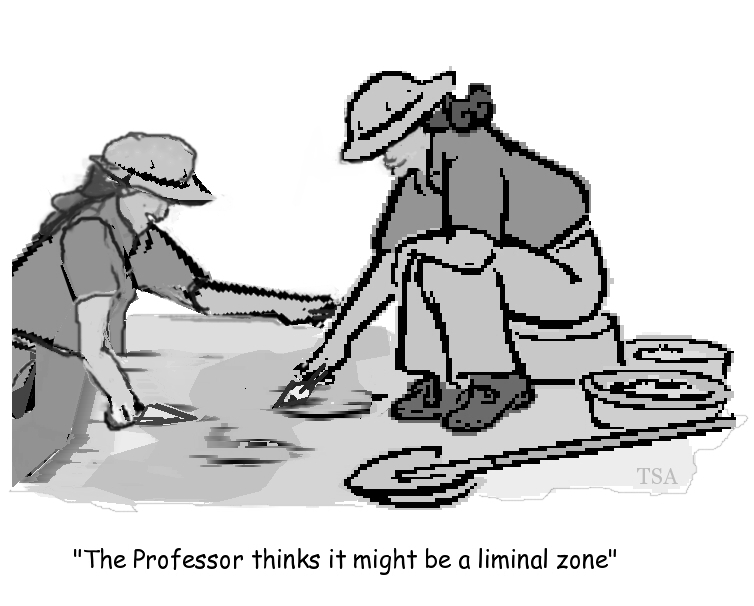 In most disciplines you would be sacked for fictionalizing your subject; in archaeology you get made a professor. Unfortunately, students come straight from school into higher education, pass exams, and soon they are teaching the rest of us how to do our jobs, without ever leaving the campus. Give me the good old culture historian approach any day! Post processual and marxist archaeology were the dullest parts of my degree course! Hi Lil, thanks for the comment; it's sad that any part of a degree in archaeology should be "dull", more worrying, it's also most irrelevant to those who have to interpret archaeology professionally. So, let's say they do know for sure that there is a connection between different cultures, especially between what they were building (from huts to weapons) and some of the rituals they were performing. Now, I think the logical question is why or how would they have known about this connection? ¶I was drawn to this post because of the 'New Age Cult' in the title. It made me think back to something I read in some promotional literature from an organization called Lucis Trust about 'making connections' and 'finding causal relations where there were only seen to be correlative.' This is an organization, by the way, that has 'consultant status' with the UN. ¶Regarding the idea of cultures around the world developing the same technology around the same time periods without having any known contact with each other, there is a tendency in Masonic lore to find references to the 'universal architect,' that reveals beauty to man for use in works of art and construction. ¶Also, there are some people (they may sound like whackos, but I they make some sense) who claim that Satan has been revealing technology to man throughout the ages, especially during the last century or so, to help man evolve. The fact that so many cultures share some pretty odd ideas in their religions (talking about pagan beliefs), especially concepts of chaos (times lacking civilization), order (civilization), knowledge=light, bringer of light usually being a supreme deity that helps man to achieve supreme enlightenment, etc. If you Google the Hiramic Legend (freemasonry), you'll find a document that explains (towards the end of the very long page) that Masonry is really a religion that helps to enlighten man about his ultimate potential (to be god-like). They also talk about the 33 bones in the spine being related to the Hindu kundalini, or ascending one's spirit (or consciousness) through the levels or Chakras (7 of them) to achieve enlightenment. Lucis Trust is a New Age NGO, basically a religious group hiding in plain sight, acting like they aren't religious, but rather philosophical. They were founded by a woman back in the 20's who had visions from 'guiding spirits' that helped her to write a book about the new destiny of mankind. ¶I guess my whole point is not that there is necessarily a conspiracy or mystical connection, only that I believe these 'New Age Cults' are either already achieving or trying to gain a lot of traction in the scientific community. I believe this group is trying to bring about the New World Order (as they talk about on their web site), and that they feel science and a 'scientific' (or secular, even) understanding of spirituality will help usher in the New Age. I think they are trying to co-opt the atheists out there with their own version of religion, and I think it's already super popular among the super-wealthy corporate types. Success freaks (people who basically never fail, or see themselves as 'too big to fail') are already deeply enmeshed in this cultish belief system, and I think they are helping to fund the movement. ¶If you really want to open your eyes and get freaked out, take a few looks at the 'Occupy movement' happening around the world currently. Did you ever imagine that such a movement could ever gain so much success, so quickly? How could this all spread so fiercely? Is it really because of the popularity of the movement or simply because the internet and social media help ideas spread like wildfire? I can think of several relatively recent social movements that didn't last or get much success, and I don't think the explanation of the difference here is simply due to demographics (talking about the difference between the tea party types compared to the current movement). I think it's almost too odd of timing to be coincidental that Google+ went public and became popular enough to be the center stage of communication over the internet, just in time for the occupations. Your comment makes my point very well; the New Age thinking, [or conspiracy], is composed of a collection of ideas that have coalesced from Theosophy onwards, and are connected only by their opposition to conventional and accepted narratives. While ancient literature is as insightful as any other about the human condition, it holds no magic secrets or great knowledge; this is one of the most conventional aspects of ‘new’ thinking, belief in the power of the ‘book’. Incidentally, I would be very worried if powerful people were not conspiring to influence events in their own interests; it is what power is for. I have read that Julius Caesar commented on how proficient the British were in the construction of wooden buildings. It is such a comment that sparks the imagination. what could hechave meant and what vision of that time are we missing. All the other spiritual discussion is just that, speculative discussion. The field is wide open for devising views based on ideas. It's not easy to establish facts in a dematerialzed world, so one has to look for material that has not decomposed and work from there. Hi Wooh - Thanks for your positive contribution; while I agree with much of what you say, I would claim that postholes represent the known position of vertical components, and that with some understanding of timber carpentry and 'assembly' we already have a considerable amount of information about the dematerialised world, at least in terms of its engineering. While I will be unlikely to know the nature of interior finish or decoration, I can understand what held the roof up, as this is entirely rational process. 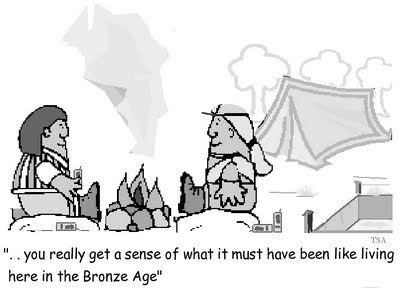 Hi Mark, thanks for the contribution; I have to agree - the History of Prehistory, is simply an oxymoron, and quite why the producers went this way is puzzling. 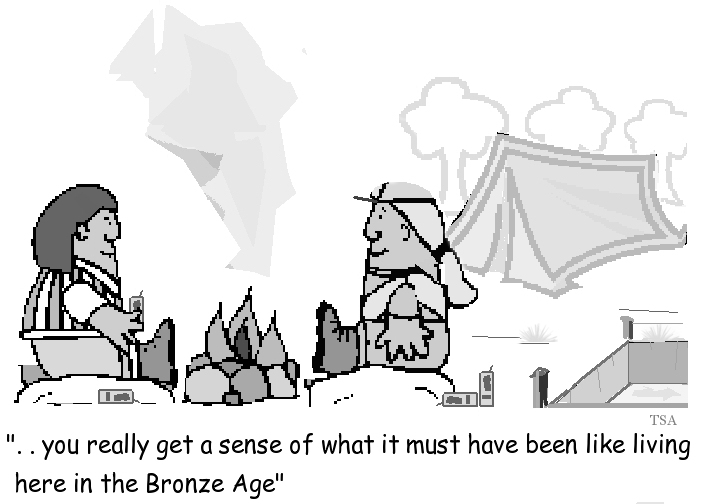 Sadly, it was very much about those things archaeologists do not find, and was filled, as you noted, with educated guesswork and supposition, some of it very poor. The program does serve as a warning to those who are thinking about studying archaeology - this is the sort of woolly stuff that you could be taught. Geoff--I just now found your blog, and this entry was the best thing I've read all day. FWIW, after getting a BA in medieval history over 20 years ago but veering off into other careers, I've been trying to get back into (at least informally) studying medieval *archaeology* as I started to back then. But if my archaeology professors had ever presented unverifiable speculations as legitimate interpretations, I would have run screaming and lost interest in the field. As much as I hate to think of people believing this kind of stuff, I also cringe at the thought of practically-minded people being driven off by the crystals and chanting. I'm a 44-year-old married parent, so there's little chance of me returning for a PhD at this point. But if I did, the prospect of any sort of a obfuscatory theory masquerading as expertise (post-processualism, post-modernism, whatever) would worry me far more than the challenges of research and coursework. My wife once encountered a linguistics grad student who said (of Chomsky) tha t "we must formulate out theories according to the dictates of the Master." Ah, science. I think of history as a specialized form of archaeology, and I know so many people who have been touched by the bug; it's such an interesting subject for the curious. When even the BBC start making programs about the history of prehistory you know you are in trouble. Post-ironic scholarship? I have serious concerns about how young archaeologists are being taught to think, its getting like alchemy; vast amounts of energy and creativity directing into trying to turn lead into gold. I feel like I've arrived far too late at this party, but great post. Emperor's new clothes, smoke and mirrors etc. etc. etc. A VAST waste of resources. Hi Conor, thanks for your contribution, sadly, it falls to us grown-ups to explain that if you only have a carrot and two potatoes, you cannot make a roast dinner - how ever much you cook them. I don't know if you saw the museum that has place a 'toy car' on display in Turkey dated 5500BC. I'm trying to work out if its a fake or genuine, so I thought I ask an expert like you or one of your engineering readers. Looking at the wheels and how they are made, it looks like a 'wood turning' technique, which gives the inner and outer regions of the wheel a higher lip - like a door knob - one would imagine if it was a fake they would used just plain round flat blanks. 3. The key technology is not the wheel, but the axle. [ I am not sure what this model shows]. 4. Consideration has to be given to draft animals - what pulled it; evidence from the archaeological bone record should be sought. 5. The Olmec made wheeled toys, but had no vehicles, because they had no animals to pull them. 6. I have also pointed out [post 35] wide vehicles/drawn sledges require modification to the built environment - roads gateways, entrances, etc. 7. Our existing understanding of the development of the wheel, although by no means certain, requires a lot more than one stray find to overturn. There is perhaps a universal problem with regard to maintaining an active blog spot. This may be dependent upon certain presumed criteria such as universal collective thinking otherwise called the collective consciousness. This airy fairy term applies to all forms of human behaviour from the down right bizarre to any recognised cultural belief system. So we humans do certain things because we are fit and healthy enough to achieve our goals coupled with having the time and the inclination to actually bother. Once we have met our goals others will feel brave enough to hide behind a degree of anonymity in order to attempt to belittle our points of view. One common form of such attack is to adopt the role of a teacher while pointing out any spelling mistakes. It is not altogether certain if such behaviour is a universal trait triggered by an unconscious desire to set the record straight or an action prompted by interaction between members of various cultures or sub cultures?